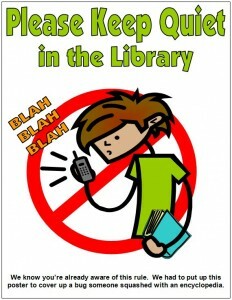 Myth #1: You can’t talk in the library. Contrary to popular belief librarians don’t revel in shushing people all day. The days of the library being a silent place of study are long-gone and librarians are embracing the community spirit. We like to think of the library as a place where students can not only do individual silent study but come to work on assignments or study with peers. To help facilitate your collaborative study needs we have group study rooms available for you to book in advance. If you need to blow off some steam after an exam or assignment, why not get a group of friends together and play some games in the Games Lab. Students are free to talk to their peers on each level of the library – except those areas that are marked for silent study (the top two floors of Gardens Point and Kelvin Grove Libraries). So remember, the library doesn’t need to be the kind of place you can hear a pin-drop but be mindful of your fellow students and keep noise to a respectful minimum (or we’ll have to shush you! ).